Curtain tracks are the perfect choice for pencil pleat headed curtains. Made with a white finish so that they blend into the background, tracks are functional and unobtrusive. 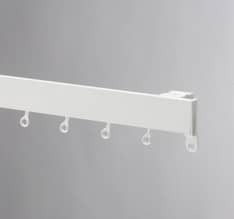 We offer two options; the Swish Sologlyde track which is economically priced and suitable for lighter curtains. 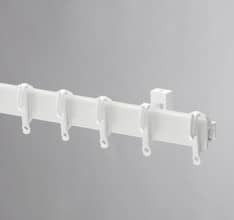 The Swish Deluxe track is more substantial and so can take heavier curtains, and offering a smooth-running system. Both tracks are easily cut down to size and come with fitting instructions that are simple and fuss free.